Day 357: Five is a Great Number . . .
Today was a great day, especially for Jean – she got to play golf . . . AND support San Juan Diego Catholic High School in Austin – WHAT a GREAT job! She and two co-workers (Lisa and Scott) plus a wonderfully supporter and friend (Ron) took to the links in order to help raise funds for the school. Now, normally the idea of playing golf and not being in the office would be tough for Jean, BUT – her boss (aka Scott) pretty much said she HAD to play . . . so, rule of thumb in our house is NEVER go against what the Boss has said. Ok, ever so slight exaggeration there . . . Jean signed up and coerced Scott and the others to play (for the record . . . the arm twisting really wasn’t all that tough). Nonetheless, a wonderful time was had by all – yes, it was a wee bit hot – but as the saying goes . . . a bad day on the golf course beats a good day in the office. Anytime she plays golf, Jean is reminded of the days as a young girl heading to the course on Saturday mornings with Bill (aka Dad) and his buddies to play a round – Jean was allowed to hit a ball with a shortened 3 Iron – to this day, one of the clubs she hits the best. She would be negligent if she didn’t mention all the fun times she and sister Sara have had on the course as well (yes, Jean can hit a tee shot further than Sara – just setting the record straight). Ok, on to other things – – – the number FIVE(5) is a really important number at Casa del Vino – ya see, we are BOTH (or as D#1 and D#2 like to say BOLTH – gotta love those inside family jokes) the FIFTH (5th) child in their families. We think that’s pretty special . . . BUT WAIT – it doesn’t stop there —- we were born on the same day / same year (approximately 45 mins apart . . . . yes, for the record, Jean is older). Brian was born at St. Joseph’s and Jean was born at St. Mary’s (pays to be Catholic to make that connection) – we were baptized on the same day – both our Dad’s worked for Shell Oil their entire careers and finally (yes, just one more – sorry P&L . . . didn’t mean another bottle) – when they got married that both had sisters who were nurses living in Denver. Call it what you will . . . we call it both Divine Intervention and a God Wink. Makes for lively conversation, especially when doing legal work and date of birth is involved. Oh, and one last coincidence – we were married on the same day. So, as you can see the number Five (5) is a big deal ’round these parts. So tonight we opened a Five Wise Meritage Blend. A wonderful combination of Cabernet Sauvignon, Merlot, Petite Verdot, Malbec and Cabernet Franc. We picked this little number up at World Market last weekend – during halftime at Dave & Busters – it was less than $12 and a BARGAIN. This wine has some really nice characteristics. The nose is pure fruit. . .lots of berries with hints of tobacco and plums. The palate opens up to a nice oak and tobacco taste along with some black raspberries and black cherries. The finish is long, smooth and memorable. . .all of the flavors stay on the finish making this wine smooth to the taste from start to finish. We enjoyed this with some smoked sausage and potatoes as well as a spinach salad. . .all in all a really nice find for not a lot of money. We’re intrigued by the wine because there isn’t a lot of information available about it. From Greenfield, California which is in Monterrey County; Greenfield is located in one of the developing wine grape growing regions of California with over twenty vineyards and wineries within a thirty mile radius, several of which have tasting rooms and offer a wide selection of wines for sale. Some of the Vineyards and Wineries located nearby are Hahn Estates Smith & Hook, San Saba, J.Lohr, Hess Select, Estancia, and Graff Family Vineyard. Having driven through this area back in October, we learned that it’s also the area know as the “Salad Bowl” for the country. There was an unbelievable amount of produce being harvested at that time. . .truly amazing. This wine is different, unique and not on a radar screen, and it’s for these reasons, you should try it. Might just sneak onto the BOndy Top Ten Wine List . . .
With so many commercial labels (heck this may even be a commercial label), it’s kind of refreshing to find one that doesn’t have 91 points or lengthy vintages in its’ history. 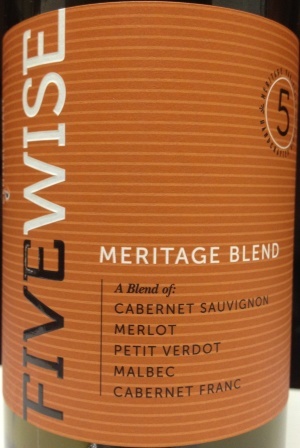 We’re open to hear from you; maybe you know something about Fivewise Meritage that can shed some light for us. Anyway, it’s Friday! Time to enjoy the weekend and your favorite wine. Please do so responsibly and remember to recycle whenever possible. Categories: Uncategorized | Tags: Five Wise Meritage Blend, golf, Meritage, Monterrry CA | Permalink.